It’s April 1988. Aswad are number one in the charts, everybody wants a Peugeot 205, Davide Tardozzi has just won some race called World Superbikes and a litre of unleaded costs 37 pence. Being just eight years-old I had different priorities, like Streethawk, doing skids on my BMX and seeing how fast my new trainers made me run. A typical family day out back then was the Rhine Army Summer Show, a Military Tattoo for forces families living in Germany. Every year we would traipse round the stands and stalls looking at tat while Dad got steadily stocious on German beer. Two things stick in my mind as memorable from those days out: watching the Red Arrows scream past and gawping through a fence at the White Helmets performing mind-bending tricks on their motorbikes. 20 years have since passed and I’m stood on the side of a windswept runway in Cornwall, watching the Royal Signals White Helmets display team running through a routine. I shouldn’t be impressed, I’ve stood in dinner queues for longer than some of them have been in the Army and my life is saturated with two-wheeled sustenance, but I can’t help it. I stand open mouthed in absolute, childish amazement as 10 blokes wobble past, hanging from one bike like a human Xmas tree. It’s a trick that hasn’t changed in over four decades, but it’s still remarkably impressive to watch in a Blue Peter kinda way. But what exactly is the continuing appeal of the White Helmets? I mean, why do they still exist today (with a completely full calendar for 2008) when your average eight year-old can do back-flips on his bike when he’s not doing back-flips on his PSP? To get a greater understanding of the White Helmets you need to know a little about their history. Trust me, I’ll keep this brief. 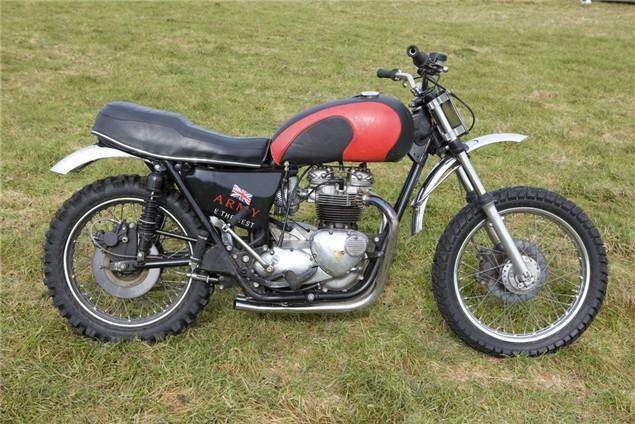 They formed in 1927 and have only ever used British bikes in their displays and have performed all over the world. 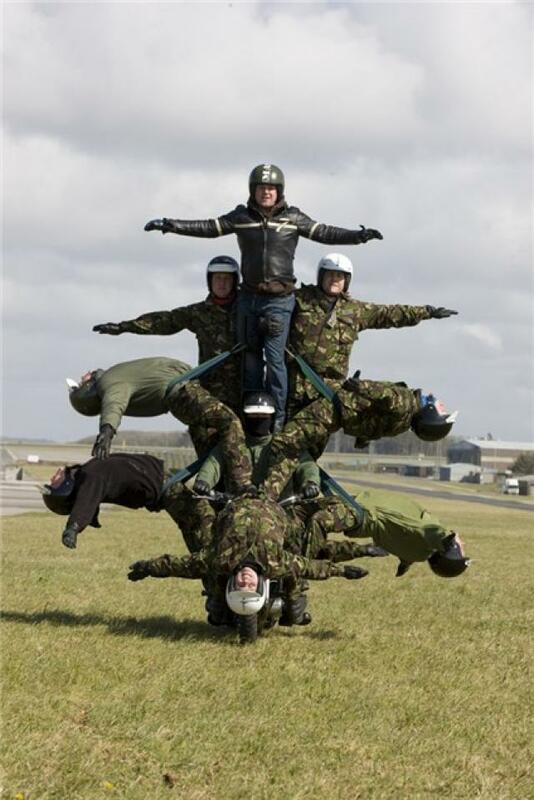 On that basis alone they are clearly the oldest open showground stunt display team in the world. By comparison, the fabled Crusty Demons are merely a bunch of teething children. There’s a well-refined process that sees any White Helmets rider metamorphosising from a humble soldier into a death-defying stunt rider. Like most things in the Army there’s a selection process that you have to apply for and then pass. To be a White Helmet perhaps the most important part of selection is to prove during the two-week course that you have the aptitude to pick a 200kg bike up after your first or 40th crash crash of the day, with a smile, and then crack on with the routine regardless of how much pain you might be in. 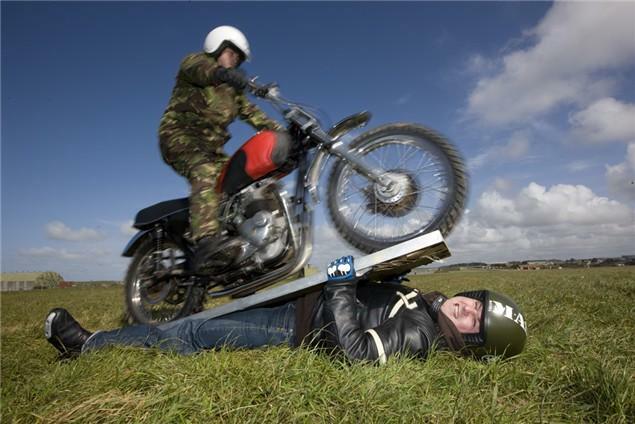 Early days are spent on XR250 Hondas riding around training areas in Dorset. 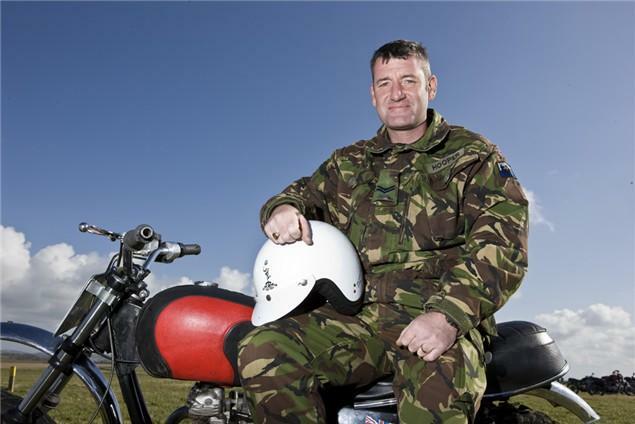 The instructors prefer candidates not to have ridden in the past as the Army thinking is that there’s no room for bad habits and road-riding styles when you’re putting yourself, your colleagues and the general public at risk every time you ride. If you thought Health & Safety was overkilled where you work, try being in the Forces. After being taught the basics of machine control riders then progress to learning a couple of simple stunts, such as wheelies and slides. To finish the course riders take part in a small demonstration of their new-found abilities, but even after that it isn’t a given that they will have a place on the team. Personal aptitude counts for a lot. During the selection phase instructors gauge if candidates have the right attributes to their character. Teamwork, self-discipline and respect of rank structure are key. Evel Knievel wouldn’t have been a White Helmet, that’s for sure. When you take a place in the troop you undertake the kind of rider training most bikers can only dream about: compulsory wheelie training from 08:30 until 13:00, then backwards riding ‘til knock off isn’t an uncommon occurrence. Imagine that! New members of the team have to wear a black helmet, until they have jumped through the fire during a show the White Helmet eludes them. This is the motorcycling equivalent of getting your green beret or Kepi Blanc, and just like in the special forces while many people apply, only a handful get through. I caught up with the troop after five weeks of intensive training at RAF St Mawgan in Newquay. Although it’s windy, the base is quiet, has lots of open grassy space and most importantly for the lads is within walking distance of the town centre should they feel the need to go out on the lash after a hard day’s wheelie practice. The troop were just sorting themselves out as I arrived, there was lots of smoking and finishing of brews going on before team Sergeant Andy Butterick called them in for a brief. This was the first sign I got of the traditional feel of the team. Freestyle MX nutters such as Nate Adams or Mike Metzger carry a tricklist stuck to the handlebars of the bike during their display so they can refer to it and see what they need to prepare for next. In proper Army fashion the White Helmets have a huge board with all the tricks written on cards and a soldier who shouts them out very loudly. Each trick is talked through, people are yelled at, have the piss taken out of them or are told to just keep doing what they are doing. The conversation is all one-way, nobody talks back until they are told to. The military grounding means that everybody in the team understands when to talk and when to just sit down, shut up and pin their ears back. With the briefing over fags are crushed into the ground by Army-issue boots and they get stuck in.